The Hypnotic Brass Ensemble is second-generation Arkestra. MNDSGN has roots in Philly (and South Jersey) but is currently based in Los Angeles. Befitting his beat scene credentials, the man born Rinngo Ancheta has been a bit enigmatic over his short career. After a prolific streak that has favored loosies, vignettes and beat tapes, Ancheta polished up and switched gears slightly for his September album “Body Wash,” which formalizes song structure in the name of some well-executed synth funk. Local band Weekender trades in several flavors of psychedelic rock. The fuzz or gritty distortion that’s the focal point on some songs gives way to jangly guitar pop on others. On the quartet’s second and latest EP, the six-song “Floaty Feeling, Blue,” those effects are stitched together in pleasantly blurry collage form. Sia has become a perpetually unlikely pop star to the point of cliche. The Australian songwriter-turned-radio-regular exercises detachment as a career-long commitment, which has allowed her to churn out hits with abandon. For her latest, “This Is Acting,” Sia recorded a batch of songs rejected by A-list singers like Adele and Beyonce. Predictably, many of them sound like smash singles. Meanwhile, Miguel’s triumphs have been celebrated critically but largely cast aside by the mainstream. On last year’s “Wildheart” the Los Angeles singer pulled off his best fusion to date, meshing rock and R&B for an unpredictable, sultry success. 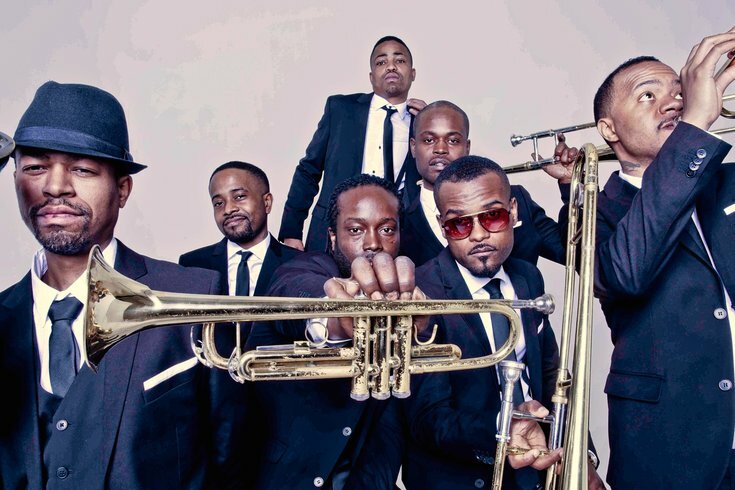 The eight brothers in Hypnotic Brass Ensemble are Chicago jazz royalty, the sons of the Sun Ra Arkestra trumpeter Phil Cohran. Like their father (and as the band name suggests) they’re horn-obsessed. The ensemble mine their brass — trumpets and trombones primarily — for hip-hop-inflected funk and jazz. Saint Motel are a certain type of indie pop incarnate. The California quartet manufactures easy going, dreamy soft rock as a mission statement. They’ve mined occasional viral success out of their cheery songwriting, and their latest lead single smartly retreads their last smash, complete with horn stabs and a tame funk groove. After years of plugging away, the band drops it first album as a major label act on Friday. He’s a local but “Big” Rich Medina’s hometown sets are sometimes few and far between. The constantly traveling DJ’s track record runs deep, an encyclopedic approach he leverages as an organic moodsetter. Celebrated for introducing dancefloors to Fela Kuti’s music in decades past, Medina remains a deep funk impresario with his finger perpetually on the pulse of the party. The Portland trio Mean Jeans rattle off carefree pop punk on their third and latest album, “Tight New Dimension.” The group has doubled down on its party anthem agenda here, channeling obvious Ramones influences and sticking to their guns.